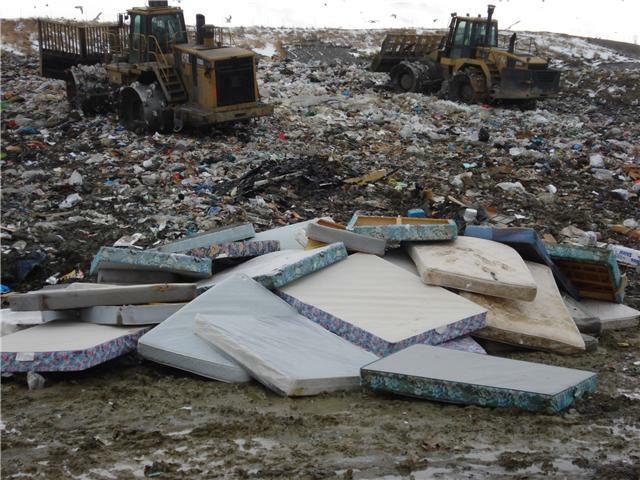 Mattress take up tons of space in landfills and are slow to decompose. Picture this: the semester’s over, and you’re moving out of your apartment. You have sold what you could and left to your roommates whatever they would take. You’ve done pretty well and can fit most of your life into a small, fuel-efficient car. But there’s one big, clunky piece of furniture remaining, staring at you from the almost-empty bedroom: your mattress. Throwing it away may not seem like a big deal, but according to the national Spring Back Mattress Recycling network, mattresses take about a decade to decompose in landfills. They don’t compress well, can damage landfill machinery, and hold pockets of air, which can cause dangerous landfill fires. Spring Back Utah Mattress Recycling, a six month old Salt Lake City company serving the entire state, answers this need. The venture, a cooperative effort by the husband and wife team of Jeff and Jenny Jewett, recycles mattresses and box springs for a small fee. It targets all three elements of the sustainable business trifecta—profit, people, and planet—by being financially self-sustaining; by hiring from populations that face barriers to employment, such as refugees or formerly-incarcerated individuals; and by diverting thousands of pounds of mattresses and box springs from landfills. Unwanted mattresses and box springs can be dropped off at the warehouse or picked up by Spring Back drivers. Workers deconstruct the mattresses, sort and bale components, and send the material to recyclers to be made into new products. Overall, Spring Back is able to recycle 95-97 percent of a mattress, and 99 percent of a box spring, says Jeff. Foam, memory foam, and pillow top layers: turned into carpet padding; sent to California in a ‘back-haul’—a truck that was heading back west from Salt Lake City that otherwise would have returned empty. Before and after: just a few of the thousands of mattresses Spring Back Utah has diverted from area landfills in the past six months. steel and 31,000 pounds of foam, in addition to the other components, Jeff says. Much of Spring Back Utah’s business thus far has come from area hotels, retailers, manufacturers, and entities like the University of Utah, Utah State University, and Zion National Park. 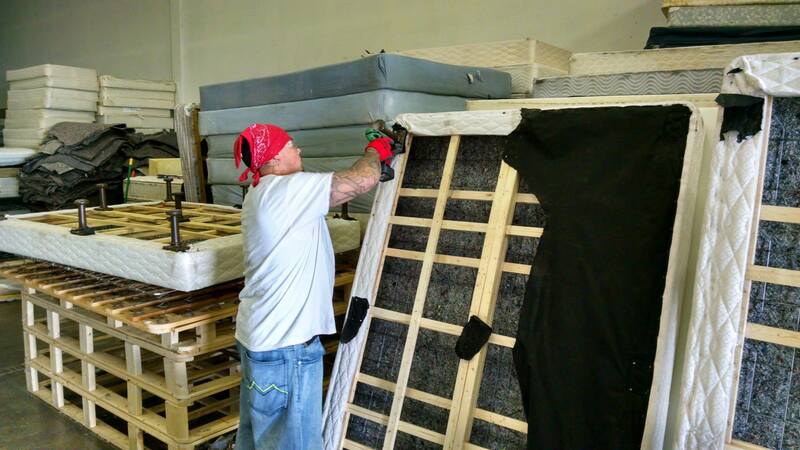 A Spring Back Utah employee disassembles a mattress inside the company’s warehouse. Rescue Mission of Salt Lake, Advantage Services (formerly Valley Services), and the Salt Lake Chapter of the International Rescue Committee. 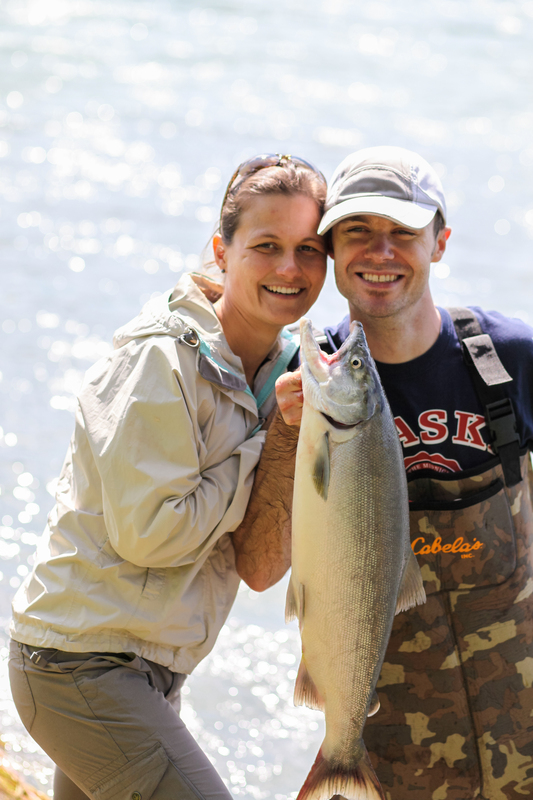 The Jewetts currently employ three people, and they say they look forward to hiring more, perhaps reaching out to additional agencies for referrals as the business grows. Jobs at Spring Back Utah help the employees in a number of ways—by teaching job-specific and warehouse-specific tasks such as forklift and baler operation and shipping/receiving skills, and by instilling soft skills, like showing up for work on time and communicating with customers and fellow employees. Jenny and Jeff Jewett, sustainable entrepreneurs at the helm of Spring Back Utah Mattress Recycling. They also love that they get to go to work together every day. “We’ve been on the journey together,” says Jenny. Because component prices fluctuate with market demand, the business is not a sustainable source of revenue on its own. 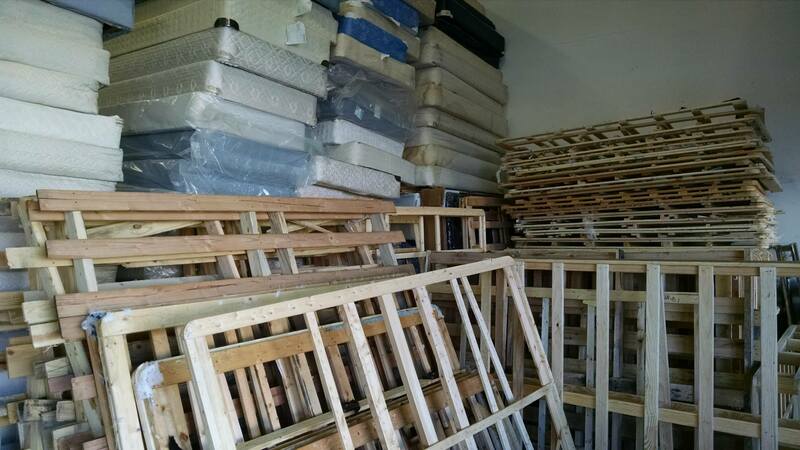 To supplement this, the company charges a small recycling fee, currently $15 per single unit of mattress or box spring or $10 per unit for two or more units. An additional pickup charge of $25 is waived if the customer drops off the mattress or box spring at the warehouse, and U of U students receive a 20 percent student discount off the recycling fee. Businesses are encouraged to call 801-906-8146 and ask about volume pricing. 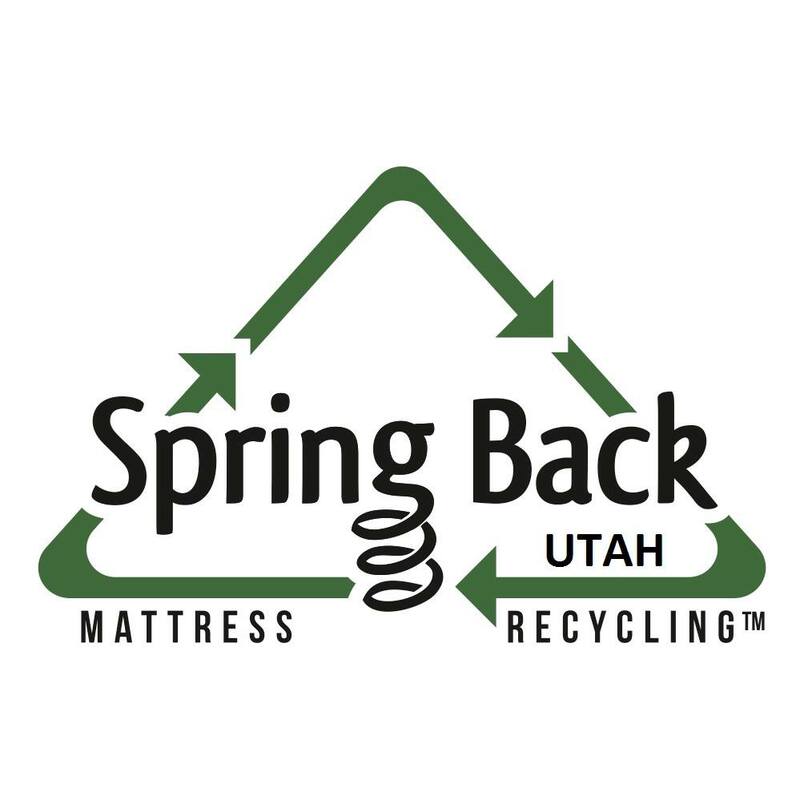 To arrange to have a mattress or box spring picked up, email info@springbackutah.com.